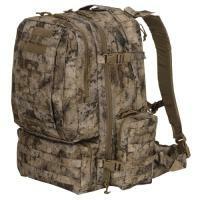 Voodoo Tactical 15-7866105000 Camouflage Tobago Cargo Pack FREE SHIPPING! Ensure nothing is ever left behind while using the Camouflage Tobago Cargo Pack from Voodoo Tactical. Featuring over 2,500 cubic inches of storage space, the cargo pack has enough room to hold everything needed for an extended mission, a weekend in the woods or a crazy adventure with friends. Front, side and rear pockets offer ample storage while internal organizers keep equipment secure and readily accessible. A double hydration compartment allows for the integration of two 3-liter bladders with room to attach a third for extended operations. Web platforms line the exterior of the pack, providing secure attachments points for MOLLE compatible pouches, holsters and bulky gear. Padded shoulder straps and a removable sternum strap balance the weight load and deliver all day comfort on long hikes. Bottom bedroll loops provide additional mounting points for pads, tents and sleeping bags. ©2002-2019 CopsPlus.com: Voodoo Tactical 15-7866105000 Camouflage Tobago Cargo Pack FREE SHIPPING!